We all want to be visible on the web. In other words, we want to attract awareness to ourselves. This is the same for whoever we are: individuals, bloggers, business owners, freelancers or entrepreneurs. Whatever your activity on the Internet, your main purpose is to draw attention to yourself, hopefully for the right reasons. Did you realise this can be done through commenting? 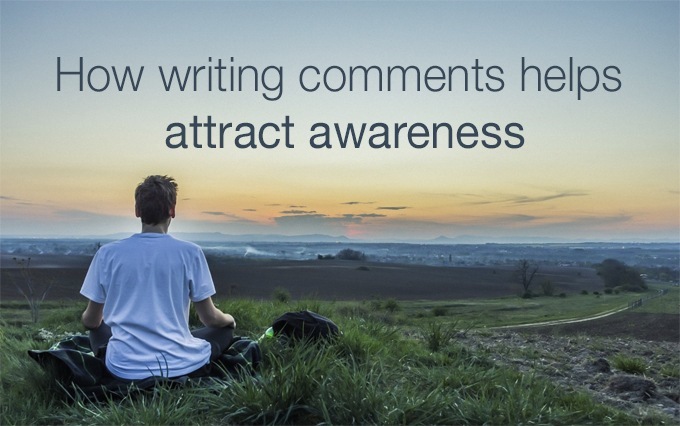 One of the best ways to do attract awareness is via commenting. Engaging with the people who you want to notice you. Interacting with them to have a conversation, so you can explain or tell them more about you. It is also a bit more than jumping up and down making a noise. Any fool can do that, and it makes them look more of a fool than they already are! Using commenting to draw attention to yourself requires skill, understanding, tact and altruism. And here's some code you could paste into your own posts (via the text mode) if you want to share this Infographic with your readers. The best way to attract aware to yourself is to be forthcoming. If you find a post that resonates with you and what you believe in, comment on it to show your appreciation to the author. Although these comments will tribute the post, there is no reason to be overtly gushing and overbearing. There is nothing more off-putting than a sycophant fawning over every word. The best way to acknowledge this is to say why you enjoyed reading the post, what difference its content makes to you, and why you felt compelled to write a comment. The best way to stand out from the crowd, especially if you want to attract awareness to yourself, is to be remembered for who you are and what you stand for. Commenting provides you with a chance to create a good impression with what you write about. How have you continued the conversation? Have you offered any helpful suggestions? Have you enhanced the original post's subject in any way? You are more likely to be remembered as a commenter if you leave behind something worthy of reading. Offer them a nugget of information that could turn you into an influencer. What special something do you have that you could share with the post's author and the other readers? What do you have up your sleeve that could make a real difference to their lives? Publishing this in a comment section will not only enhance the original post, but broadcast your valuableness to all readers and other commenters who pass by. Provide the kind of information that cannot be ignored. However, it needs to be totally relevant to the original subject, or its worthiness will be dismissed and ignored. Are you brave enough to go first? If you are lucky enough to be the first to leave a comment, it will probably be the first one other readers and potential commenters get to see. This is a great position to attract awareness about yourself. It's the equivalent of having an update pinned to the top. This is a chance to shine out above the others. However, you could enhance this opportunity by starting a scintillating discussion that encourages other comments. Something the post's author would thank you and definitely notice you for. As I said above, if you can start a relevant discussion around the original post's subject, that will attract awareness to you. As long as how you did this is correct and feasible. Keep stoking the flames to encourage others to participate. Draw in those who provide value and get the online community to help you manage those who step out of line. The comment section will thrive if you are able to entice other readers to have their point of view and express themselves. And by being the Maître d' of the discussion thread will help draw attention to you. The best kind of comments are the conversational ones. And the best conversations are those that don't focus on just one person, but include everyone who is involved. Write comments that are outbound before you start to mention yourself. Any reference to you should be in relation to something else and totally relevant to the subject matter. Commenting is not a method for self-promotion. This is the mistake spammers make, and they have almost destroyed commenting. Only offer an external link if it is absolutely necessary and provides an example or explanation that enhances the conversation. Comments become more practical and useful if they include a question that is referenced to the original post. Asking for a clarification or an explanation to the subject will encourage the author to reply. And this response that could stimulate a discussion, and encourage other readers and commenters to add their own answers. Questions are the opposite to conversation stoppers, as people are compelled to answer them. After you've carefully read the post and the other comments, think of a question that could result in a favourable response. And a well placed and apt question could easily attract awareness of who you are and what you represent. Part of encouraging more comments and discussion is to write one yourself that will stimulate a response. What could you write that is thought-provoking or even controversial? Now you have to be careful here not to alienate the other readers and commenters. Keep to the subject matter and avoid stepping over the line. There's no need to be classed as a trouble-maker or even troll before you've begun! Raising your head above the parapet will certainly draw attention to yourself, but make sure it is for the right reasons and not detrimental to you and what you stand for. Another way to stand out from the crowd is to be instantly understandable by many. One of the best ways to do this is via story-telling. Everybody likes a story, and they are usually told using ordinary words which their listeners also use, and therefore can relate to. Using a story to tell an anecdote that is relevant to the original post can be quite powerful, especially if it helps people to understand your point of view better. Story-tellers usually attract an audience, so think how you could attract awareness to yourself by relating something that entertains as well as educates. At the end of the day, it's all about giving rather than receiving. So even if you go through the motions of writing an absolutely superb comment, it is wasted if nobody reads it. Take time to share the original post on your social media platforms. Here is another place where you can comment, as an introduction for the shared link will make it more likely to be clicked on. Any author worth their salt will be delighted at your treatment of their post, not only commenting, but sharing too. This good deed will definitely get you noticed. What are you doing to attract awareness to yourself? How often do you make an effort to comment on a post you read and enjoy? Did it cross your mind that doing this could help attract awareness to you and what you do? It's worth pausing and reflecting on not only how you could benefit from commenting, but how others would too. This slight delay could be put to good use thinking of a suitable contribution as well. Let me know in the comment box below if you have had any success through commenting and being able to attract awareness to yourself.